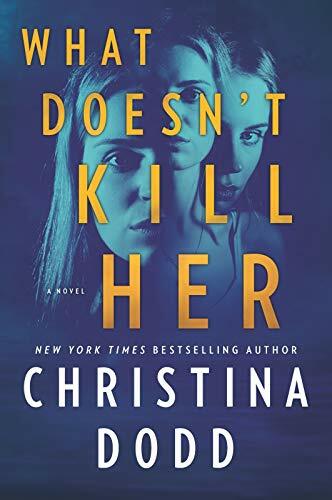 In the second of her Cape Charade series, What Doesn’t Kill Her, Christina Dodd brings more grief to heroine Kellen Adams. Kellen’s job at the DiLuca Winery is turned upside down when Roderick, a difficult guest at the B&B, is found to be hanging by his hands from the roof of the establishment, and Kellen rushes to rescue him. The rescue is a success until Roderick attempts to kill Kellen, for no apparent reason. She escapes his wrath when she is given a simple assignment to deliver a piece of antiquity and the assignment goes awry. Now, Kellen, who isn’t really Kellen, (and who is living a lie that includes giving birth to a child—Rae—while in a coma) discovers to her horror that when she embarks on this task, her seven-year-old daughter has decided to join her and slips into Kellen’s vehicle, unannounced. Kellen’s history and her present life are a mess. Living with a man she loves at his family’s winery is made difficult when Rae’s grandmother Verona dislikes her; Rae’s father Max is giving her room to come around and that is just not happening; and she is frightened of developing a relationship with a precocious seven-year-old. It doesn’t take long for Kellen to discover that the assignment she has been given is more dangerous than simply delivering an antiquity. She quickly realizes that the driver assigned to accompany her, Horst Teagarten, is attempting to kill her, all while Rae is a stowaway on the assignment. Kellen’s military training quickly kicks into action when she disarms Horst but is shocked to learn that others are on her trail with the same goal—her destruction. She is now forced to not only find her own way to the Restorer’s cabin with the antiquity, but she is encumbered with a child whom she must also protect. Dodd is excellent at taking this situation and placing her heroine in most difficult situations. Her descriptions of how Kellen races against time to save both characters is well conceived, plotted out, and presented in a series of spine-tingling events. And at the same time Dodd develops the previous non-relationship between mother and daughter into a tight one of reliability and love. At the worst moment of Kellen’s life, she and Rae are both rescued by Max, who convinces Kellen to marry him. That would be a lovely end to a tension-heavy story, but it’s not the end. Once Max, Kellen, and Rae safely return to the winery and the wedding plans march forward, Kellen’s life is once again threatened. Dodd brings the story to a strong conclusion, but Kellen’s situation is not ended, and surely there is a third story in the works. Dodd is skilled at bringing the reader from one story to the next without a lot of heavy backstory or history. She weaves the facts in, in a way that readers of the previous story, or those new to her tale will have no trouble picking up where the last one left off. Presumably she will apply this skill to the next book. This is a good series to follow and a fast read. Judith Reveal lives in rural Maryland. She is the author of the Lindsey Gale Mystery series including: Cheating Death, The Music Room, A House to Kill For; historical fiction, The Brownstone; and nonfiction The Four Elements of Fiction: Character, Setting, Situation, and Theme; Around Greensboro; as well as a memoir, Essays on Growing up Middle Class in Post World War II America.